Working in the Marketing field in the late 1980's I sought something to reduce my over-all stress level and found exactly what I needed with my first Kripalu Yoga class. More than temporary stress relief, I came home to myself and connected with a deep peace within. Yoga became an essential part of my life, and as a natural progression of this, I started the process of becoming a Yoga Teacher in the summer of 1993. The bountiful rewards from teaching yoga substantially eclipsed my full-time corporate job and Dec. 31, 1993, I left behind a 10 year marketing career to help and inspire others through Yoga, Meditation, Massage and Nutrition. 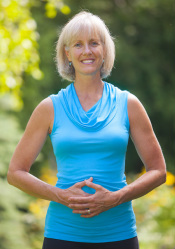 Although I no longer practice massage, in 2009 I became a Registered Holistic Nutritionist and offer nutrition consultations, educational seminars and primarily Raw Food Classes. It is my personal experience that healthy life choices: healthy food, meditative physical movement (yoga) and seated meditation practices - take us a long way down the path to living healthier, happier, more balanced lives. And that is my wish for you! Highlights of Cheryl's resume: I am eternally grateful for all my teachers. 2009 completed a two year program at the Canadian School of Natural Nutrition (CSNN) and became a Registered Holistic Nutritionist. 2005-6 Functional Anatomy (32 hours) with Jayelle Lindsay, (registered Physiotherapist & Certified Yoga Teacher). 2002-2003 Viniyoga Foundation Course (150 hours) with Paul Harvey focusing on therapeutic aspects of yoga. 2002 Certified Meditation Teacher after 6 months of study at the Buddhist Willpower Institute (5 days/week, 2 hours each day). 2000 I studied with Jon Kabat-Zinn and Saki Santorelli in a Mindfulness-Based Stress Reduction in Mind Body Medicine: Professional Training Retreat (60 hours). 2000 Certified Ashtanga Teacher, Toronto with David Swenson. 1994 Certified Massage Therapist at the Harold J. Reilly School of Massotherapy in Virginia Beach, Virginia. (While I no longer practice massage, the skills I learned remain a part of my practice in working with students). I was a Certified Reflexologist and Hynotherapist. 1993, I began my “Kripalu Yoga Teacher Certification” at the Kripalu Centre in Massachusetts. In 1995 I became fully certified. Some of the many other Teachers that I have studied with and that influenced me are: Gary Kraftsaw; Richard Miller; Stephen Cope; Donna Farhi; and Erik Schiffmann; Tara Brach.